Russia’s Central Asian neighbor shares many of Moscow’s same concerns, and this has helped to forge a dynamic partnership between the two countries. Thanks to a lucky roll of the geographic dice, Tajikistan, a landlocked nation of 7 million people, is surprisingly blessed with breathtaking vistas, pristine lakes and spectacular mountain ranges that look as if they were lifted from a travel brochure for the Austrian Alps. But beneath the raw, rugged beauty is a country with a host of pressing concerns, and it is fortunate for Dushanbe, the capital, that Tajikistan’s problems are also Russia’s problems. Tajikistan’s many miles of mountain ranges (fifty percent of the country is over 3,000 meters, or around 10,000 ft, above sea level) that serve as a buffer against Afghanistan cannot protect it from drug traffickers. In fact, the breathtaking ranges, dotted with ancient passageways, caves and painstakingly dug tunnels have made Central Asia’s version of the “war on drugs” – specifically Afghan heroin – all the more daunting. Russia understands better than any other nation the destructive effects of opium. According to a recent UN report, Russia – which consumed a whopping 70 tons of Afghan heroin last year – ranks as the world's biggest “importer” of heroin. This figure is more than three times the amount consumed in the United States and Canada combined (it should be noted that cocaine is king of the block in North America), and much higher than previous estimates. The number of heroin addicts in Russia has skyrocketed during the past decade, and there are presently 30,000 to 40,000 drug-related deaths in the country each year, according to figures provided by the Russian government. Up to 30,000 of those deaths are being blamed on Afghan heroin. Against the backdrop of ominous demographic figures, Russian leaders have made repeated calls for the United States to crackdown on Afghan opium, and the issue was even brought up during President Barack Obama's and Secretary of State Hillary Clinton's visits to Moscow this year. In May, Viktor Ivanov, the head of Russia's federal drug-control agency, said that about 180 Afghan drug cartels were trafficking heroin to Russia. Last month, Tajik President Emomali Rakhmon paid a three-day visit to Moscow where he and President Dmitry Medvedev emphasized the need to stabilize Afghanistan, where the Taliban are using drug money from Russia to purchase weapons to fight NATO forces. Although Tajik and Russian drug inspectors believe they are making some headway against heroin, another drug is quickly filling the void. The amount of cannabis, popularly known as marijuana, is on the rise, which may be an indication of larger cannabis production in Afghanistan, a source at the Tajik Presidential Drug Control Agency told Interfax. While the percentage of seized cannabis increased 13.5 percent between January and September, the amount of seized opiates, the narcotic derived from poppy seeds, dropped almost 50 percent in the same period the source said. In light of the many problems being faced by NATO forces in Afghanistan, compounded by drug trafficking, Russia’s military presence in Tajikistan has taken on a whole new dimension. In early 1990s, during the civil war in Tajikistan, the base – originally the Soviet Union's 201st infantry unit, which has been located in Tajikistan since the fall of 1945 – went under Russia’s jurisdiction. Since May 1993, the base operated under various agreements reached by the two countries. The base hosts 7,000 troops and an assortment of tanks, armored vehicles and surface-to-air missiles. Russian-Tajik military co-operation will be maintained "for the sake of national and regional security,” said a joint statement by both presidents. As a side note, beginning in the early nineties, Russian troops served as special border guards on the Tajik-Afghan border. 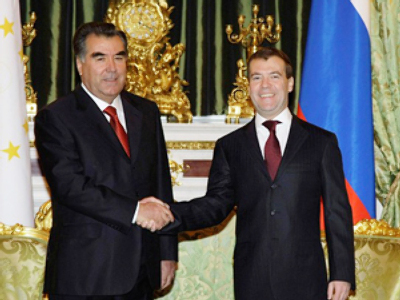 Russia handed over those duties to the Tajik Army in July 2005. Today, a handful of Russian advisers work and train with Tajik forces in an effort to better protect the sensitive border zone. “I think, we should get back to some ideas that have been expressed and think about creating new formats of work,” said Medvedev. Russia's only other permanent base in the region is in Kant, Kyrgyzstan, an aviation group that serves under the auspices of the Collective Security Treaty Organization. In addition to military cooperation, Tajikistan and Russia, together with China, Kazakhstan, Kyrgyzstan and Uzbekistan, are both members of the Shanghai Cooperation Organization (SCO), which is showing much promise as a regional organization for tamping down local problems. Mongolia, India, Pakistan and Iran are observers of the group. In an effort to cement relations between members of the SCO, Chinese Vice Premier Zhang Dejiang last week suggested that members work out an agreement on the facilitation of road transport as soon as possible, which could make for a tangible link for regional transportation. As long as the drug traffickers are kept off of this futuristic Silk Road, the plan seems to have much merit. The joint communique stressed cooperation in customs through simplifying trade procedures, improving custom-clearance capabilities, as well as improving infrastructure. On the more virtual level, a plan was floated to implement a "SCO information super highway" and "cross-border digital cooperation by using digital signatures," a plan that would certainly help to boost the Tajik economy, now experiencing the doldrums due to the global financial crisis. Finally, on a sensitive international subject, Tajikistan has announced its support for Iran's membership bid to join the SCO after a meeting that was held between the Tajik President and the Iranian foreign minister. President Mahmoud Ahmadinejad of Iran has commented that "Iran and Tajikistan are one spirit in two bodies." He also added that there are no limits to the expansion of relations between the two countries and that "We do not feel that we have a non-Iranian guest with us thanks to the many commonalities our two countries share". Tajikistan has been on the road to economic and political recovery with the election of Imomali Rakhmonov in 1994, a year that also gave the Tajik people a new constitution. This recovery has forged a mutually advantageous business relationship between Dushanbe and Moscow in the form of big energy deals. Last month, Russia confirmed its intention to construct three medium-capacity hydroelectric power stations in Tajikistan, while a total of 12 investment projects worth 3bn somoni (over $700m dollars) are being implemented in the country. In addition to fortifying Tajikistan’s unpredictable power supplies, these long-term projects will create thousands of construction jobs in the country. The projects include the construction of hydroelectric power plants with small and medium capacities, the construction of electric power lines and other energy infrastructure, as well as modernizing existing electric power stations, which includes the hulking Norak hydroelectric power station with a capacity of 3,000 MW. There is also the golden opportunity for Tajikistan to become an energy exporter, especially with economic powerhouse China right next door. "The implementation of these projects will allow Tajikistan not only to provide itself with cheap electric energy in full, but also to export it to other countries," the Tajik president noted. For the last few years, Tajikistan has been experiencing a serious energy crisis, especially during the autumn and winter periods when energy consumption peaks in the country. On a much brighter note, Russia's Rosatom state-owned corporation is starting detailed talks on the development of uranium deposits in Tajikistan, its deputy head Nikolay Spassky told the press in Dushanbe on Friday. "There have been reports that Tajikistan has new uranium deposits. All this requires concrete study. We are ready for the job and interested in it. We are presently getting down to practical cooperation," he said on the sidelines of the fifth session of the Council for Cooperation in Peaceful Use of Nuclear Energy with the Integration Committee of the Eurasian Economic Community (EurAsEC), Interfax reported. Among the many plans for helping to boost Tajikistan’s economy is an idea to lure tourists into the region, which is blessed with majestic mountains and fish-filled lakes. The Fergana Valley, for example, which spreads across eastern Uzbekistan, Kyrgyzstan and Tajikistan, is a rich and fertile region in Central Asia. The climate of this undiscovered valley is dry and warm. In March the temperature reaches 20 °C (68 °F), and then rises to 35 °C (95 °F) in June, July and August. Tajikistan is also home to the beautiful Fann Mountains, which are part of the western Pamir-Alay mountain system. The Fanns, as they are called, boast about 100 stunning peaks, with several rising to altitudes of more than 5,000 meters. The highest point is Chimtarga peak, which tops off at 5489 meters (18,008 feet). The highest mountain in Tajikistan, not to mention the former Soviet Union, is Ismoil Somoni Peak (formerly known as “Communism Peak”), the highest mountain in Tajikistan at 7,495 meters (24,590 feet). There are also many beautiful lakes in the Fanns. The best known are Alaudin Lake the Chapdara River valley, Kulikalon Lake on the northern slope of Chimtarga peak, Allo Lake and the most outstanding of all Iskanderkul Lake. But it seems the cat is already out of the bag concerning Tajikistan’s attractiveness as a tourist destination. According to the deputy head of the Committee for Youth, Sports and Tourism Affairs, there are 145 tourist companies now operating in Tajikistan, and some 90 percent of them are developing tourism inside of the country. According to the most recent data, 11,000 tourists from 58 countries have visited Tajikistan over the first nine months of this year, which is 10 percent more than in the same period of last year, Lochin Fayzulloyev said in an interview with Asia-Plus last month.